Project obstacles and solutions: The Shady Rest Farm is a hog stock breeding farm in Magnolia, Kentucky. The farm is run by the Ragland family, who have had nine generations of farmers in LaRue County dating back to 1808. Shady Rest is a fully sustainable hog farm, producing their own corn for feed and using the hog waste as fertilizer for their fields. They are expanding their operations to include four new barns on their site. Bellar Construction Management, who specializes in hog farm construction, was hired as the contractor for this project. Since modern pig farming is done entirely indoors in a climate controlled and sustainable environment, it was important the structures were capable of separating and processing hog waste that is then used as fertilizer. The lower level of each barn was poured with a 4,000 psi concrete mix that were tied into the walls to create monolithic floors and walls. The wall mix was designed with a blended aggregate to provide strength. The upper level was fit with a prefabricated grid floor that allowed waste to be hosed off into the lower level storage area. The upper level of each barn was walled off with concrete partitions according to its function. The Breeding and Gestation Barn was fit for larger animals. The Farrowing and Birthing Barn was sectioned off for individual sows and their litters. IMI supplied 3,000 yards of concrete for the four new barns. The largest pours included the lower level slabs, which were pumped to the site. The pours required two mixer trucks feeding the pump continuously throughout the pour. Shady Rest Farm is located 30 minutes from the IMI Concrete Plant in Elizabethtown. Timing and spacing of the trucks were critical. Ideally, trucks needed to be emptied within 40 minutes of leaving the plant. IMI dispatch and production timed the spacing of the trucks to make sure the pours were not interrupted, but that the concrete was not too mature to be used. When completed, the Shady Rest Farm will expand their operations from 2,000 head of hogs to nearly 5,000. 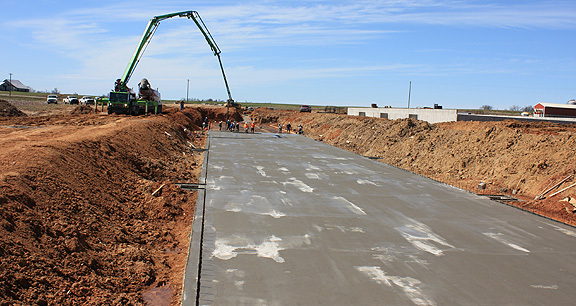 For more information on concrete for use in agriculture or live stock farming, contact the sales representative for the plant nearest your location. Click here.